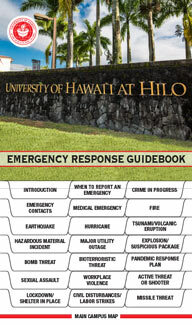 Pursuant to the Jeanne Clery Act, the University of Hawaiʻi provides daily public information regarding Clery reportable crimes that have been committed on campus, immediately adjacent to the campus, and on off-campus sites operated by the University. Please note that some reports are not available until several days after the incident. The information listed here is subject to change without notice. For a complete list, please contact the Director of Security at (808) 932-7644.